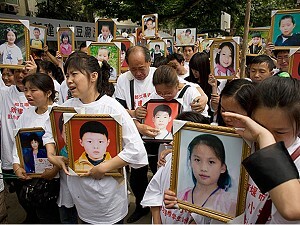 After initially promising a full investigation into the widespread collapse of school buildings in the Sichuan earthquake and to bring those responsible to justice, the Chinese Communist Party (CCP) changed course on Tuesday, breaking up protests by parents of dead children, and arresting some. Over 100 police were reported to have been stationed outside Dujiangyan People's Court in Sichuan province, where grieving parents have been presenting their cases regularly since the earthquake. Policemen reportedly manhandled protesters and then dragged them away from the court. They also prevented parents from delivering their papers to the court. There was no official response on why the wreaths were removed. The crackdown on the protests comes shortly after the Chinese regime ordered journalists to tone down stories critical of the quality of the school buildings that are referred to in China as “tofu” for their poor quality and strength. In some districts, school buildings were the only ones to collapse while several government buildings remained intact. The quake killed 69,000 people, many of whom were schoolchildren trapped under school buildings that collapsed, and left China in a state of mourning. Several Chinese are wondering whether the clampdown comes under the orders of Zhou Yongkang, currently Secretary of the CCP's Central Political and Legislative Committee, who was the Secretary of the Sichuan Provincial Committee from 1999 to 2002, during which time several school buildings of shoddy quality were built.